The Karate Kid goes surfing. Based on the true (more or less) story of surfing icon Jay Moriarty, we follow his quest to surf Northern California's most dangerous wave, and the local legend who takes him under his wing. What begins as a mentorship turns into a unique lifelong bond, as the two unlikely friends discover that there is nothing more powerful than pushing your limits and chasing a nearly impossible dream. Let's hope there's no sharks today. 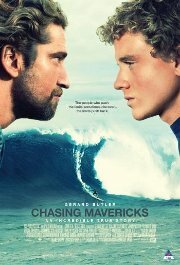 Comments A teenage boy living in California has dreams of conquering Mavericks, huge waves that surfers both fear and respect. He can't do it without the help of Frosty, a local surfing legend who will guide young Jay along the path to courage and the defeat of his demons.